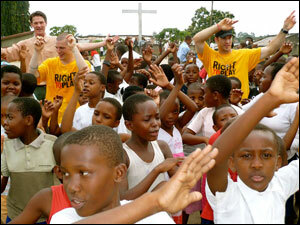 Andrew Ference recently traveled to Africa with "Right to Play." The Bruins D-man kept a diary on his journey and you can read his thoughts about the trip in this seven installment series. And so starts my journey to Tanzania. A quick glimpse of the news before leaving Canada shows the police in London, England, defusing the devices in the Piccadilly Circus area of the great city. At that moment it just so happens that I am kissing my wife and daughter good-bye before boarding a plane to the UK. Previous to that story on TV, I was actually concerned that the security lineup might be atrocious because of the threat. This is the moment that I realize that although this trip to Africa will benefit the children involved in the "Right to Play" programs, even more so, it will greatly benefit me. After all, here I am worried about having to stand in a long line in Heathrow when the world around me produces people trying to blow other people up with gas and nails! Now that I am thinking about it, what is my line compared to the lines of people waiting for food and medicine, or the lines of people escaping war? Yes, this is without a doubt a chance to hit the reset button. I want to put my perspective of the world, and "the stresses" in my life back in proper order. In case you didn't know what exactly is going on that places me on a plane to Africa, I am scant hours away from arriving in Tanzania to embark on a whirlwind tour of the country, visiting different "Right to Play" programs that have been established there. Steve Montador of the Florida Panthers and Mark Brender of "Right to Play" Canada will join me. Also making the trip is Rob Simpson and our trusty cameraman Pat, both from NESN. They will be making a documentary for the NHL network focusing on the power of sport and "Right to Play." What exactly is "Right to Play?" Whether it is conflict resolution, cooperation, confidence or simply just a smile, playing with other kids just might be one of the greatest learning tools around. Bringing this tool to AIDS orphans, young refugees and former child soldiers gives them a chance to reclaim their childhoods and learn these valuable lessons. In one of the poorest countries in the world, with the highest population of refugees on this planet, it is without a doubt in need of some help, and our programs are using sport in an attempt to mitigate some of their issues. I got involved with "Right to Play" mainly because they make a real difference and "Right to Play" has a proven track record. The UN has praised the results of their programs as the seemingly simple concept has done wonders in educating kids around the developing world. The program's successes range from widespread immunization programs to AIDS education, school attendance to breaking down gender barriers for young girls. Something that I took for granted as a child -- playing a game with my buddies -- is, sadly, a very new experience for many children. It is, however, an experience that is making a true difference in many young lives. Many thoughts went through my head as I waited to board my plane. When I am sitting here in London 10 days from now, will I have made some kind of difference? Can hockey players from Canada make a Tanzanian child's life better? Can helping that same child make our lives more complete? Will the store that is across the hall from me right now, shelves lined with $8000 purses, induce a sickness in me over what we consider important in the West? Will my own selfish indulgences make me ashamed? One thing I am sure I can guarantee, we will not fix Africa's problems, but those of us on this mission can be another small stepping stone along the route to helping the next generation of Africans to overcome some monumental problems. And perhaps, with a little bit of help, they can give their future generations the much deserved gift of a true childhood, full of laughter and innocence.